Insurance & Risk Management Student Wins National White Paper Contest & Trip To D.C.
UHD Insurance and Risk Management student Bryan Sanders recently returned from an all expenses paid trip to Washington, D.C. for the Wholesale & Specialty Insurance Association (WSIA) 2019 National Conference in February. During the Fall 2018 semester, Dr. Pam Hurley, Associate Professor of Insurance and Risk Management notified her students of the WSIA white paper contest. Each year the trade organization hosts the contest to educate students about the surplus lines of the insurance and risk management industry. Sanders looked into the topics and rubric for the contest to see if it could pull double duty since he knew completing a research paper was part of the course curriculum anyway. Sanders won a $1,000 prize, plus both his and Dr. Hurley’s airfare and hotel expenses for the 3-day WSIA conference were covered by the organization. Sanders is the third student from University of Houston-Downtown to win this award, according to Dr. Hurley. 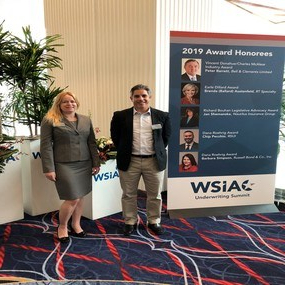 At the conference, Sanders and the other two white paper contest winners were recognized during the welcome reception breakfast and his paper was published on the WSIA website. Throughout the conference, Sanders shadowed brokers, underwriters and insurance executives at their meetings and breakout sessions. He also sat in on a great question and answer session between President George W. Bush and his daughter Jenna Bush Hager, who was moderating. Sanders has been working in claims for Geico for the past 18 years and said that he learned a tremendous amount about the surplus lines aspect of insurance and it has really opened his eyes to other opportunities and career paths once he completes his degree. The insurance and risk management field wasn’t initially where Sanders aspired to be. He originally studied to be an engineer and in his mid-20’s he moved to California to explore the opportunities available there. While he was searching for the right engineering opportunity, he started working for Geico as an entry level claims representative and the rest is history. Sanders eventually moved to Houston and started searching for business programs to take advantage of Geico’s employee tuition assistance. He found the University of Houston-Downtown Marilyn Davies College of Business Insurance and Risk Management program and immediately knew this would be the right degree for him. He said it is a perfect fit with his resume and it will help him expand into the next phase of his career.